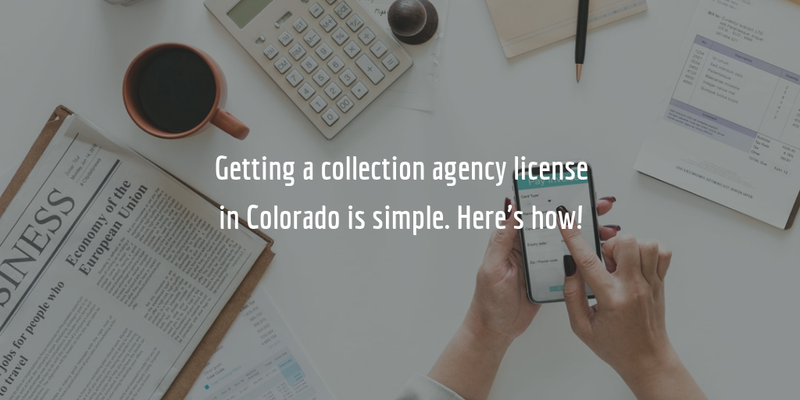 Here's How to Get a Colorado Collection Agency License! The Colorado Fair Debt Collection Practices Act (CFDCPA) requires individuals and businesses wishing to collect debt in the state to apply for a license. Collection agency licenses in the state are issued by the Colorado Department of Law. To get a license, you must complete the specific licensing requirements which include getting a business registration, a collection agency surety bond, submitting a financial statement, and several others. Keep reading to find out if you need to get a Colorado collection agency license, and how to apply for one. **NEW:** Learn how to open a collection agency in even more detail by downloading our FREE ebook guide! Who needs to get a Colorado collection agency license? These are also the people and businesses that need to obtain a collection agency license in the state. How to get a license? Your compliance with the above requirements will need to be reflected in your application. The application form includes a detailed checklist that specifies all the necessary documents that certify your compliance and which you need to attach. Once you are ready with your application, you can proceed with submitting it to the Colorado Department of Law. Along with your application, you will need to pay a $500 investigation fee. If your application has any deficiencies, you will be notified of these and will have 90 days to correct them. Once the investigation process is completed and your application is approved, you will be asked to pay a $1,000 licensing fee after which you will officially be licensed as a debt collector in Colorado. Debt collectors in Colorado are required to obtain and maintain at all times a surety bond in an amount of at least $12,000. An additional $2,000 must be added to the bond amount for every $10,000 or part thereof by which the average monthly remittances or sums owed to a collector’s clients during the previous year exceeds $15,000. The maximum surety bond amount is $20,000. The cost of your bond is equal to only a percentage of the full bond amount. This percentage is determined by the surety when you apply, on the basis of your personal credit score. The higher an applicant’s credit score, the lower their bond rate. Get an estimate of your bond cost through our bond calculator below! Why is this bond required? This surety bond serves as a guarantee that licensed collectors will comply with the CFDCPA. The bond specifically guarantees that any sums collected by a collector must be paid to their clients, less charges for collection, as they have agreed upon in their agreement. Moreover, the bond guarantees that upon written demand, a collector will return any valuable papers, notes and anything else provided by the client to them, as required by law. Finally, the bond guarantees that if a collector violates any of these conditions a claim can be filed against their bond for compensations. In such a case, and if demanded by the Administrator of the Department, the collector and the surety will need to pay the amount of a claim to the Administrator.